This basket is likely to be standard to other Explorer group caravans. Hi ,I’m trying to find the habitation door latch for my 1995 autosleeper executive ,I’ve been told it is the same as used on the Landover discovery mk1 nearside ,but what ive seen on ebay etc seems not to match what is fitted at the moment ,if you have any parts a picture would be handy so I can compare it to one already fitted,thanks for any help. Front window bailey discovery 2004 thanks. hi, I am looking for the shell of a caravan for storage, could you help me with this? thanks. Hello I'm looking for a replacement Heki 2 skylight . Hi caravan breakers Essex I am making enquiry as to whether you can help me in regard to my wanting to replace a front window damaged in the recent gales. It is from a 1996 Compass 360 Merit. The colour of the Roxite window is like a smoke colour- hinting towards a slight purple It is the centre main window- not the 2 smaller windows either side which are both ok. The measurements are : 89 cm wide and 83 cm deep. The damaged one has 4 window securers- 2 at bottom one each side. these are all ok and I can transfer them to the new window. The extending stay units however were both damaged and I would ask how much you would charge for these in addition to the window- if indeed you. 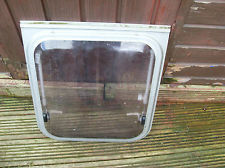 Do have this size window ins stock the markings on the window are as follows: ROXITE 80 MM (wavy line) 401 Then vertically aside these numbers it has 9510 and then underneath PMMA We live at Crewe and as its only just over an hour to you I would wish to collect them rather than you post if at all possible. So caravan breakers Essex could you please let me know if you have a replacement in stock please and if so how much would you charge for the unit? And of course- separately for the stays as well? thanking you in anticipation. Hi caravan breakers Essex, I am trying to find an exterior door for an Elddis Whirlwind approximately 1982. Do you have any? Regards. Avondale Sport 80 Roof vent is approx 300mX340m. Avondale bianco 54 05 n/s front window 960 approx 560 approx. Avondale Dart 510/5L 04 Rear window double glazed Roxite 43R 1158mm x 630mm VX/B poylplastic, Roxite PMMA 43R-0017540405 Holland. Avondale leda 98 front window its for an avondale leda cheviot caravan. Avondale Dart 03 Bench Seat cushions and single Seat cushions green. Hi I am looking for a rear window for an Avondale Olympus pearl touring caravan 1988 Size is 59 inches by 22 inches Do you have one in stock Thank you in advance caravan breakers Essex. Or Would You Like To Search For The Spares You Need By Area Or If You Would Rather Search By Manufacturer Links To All Parts Pages.